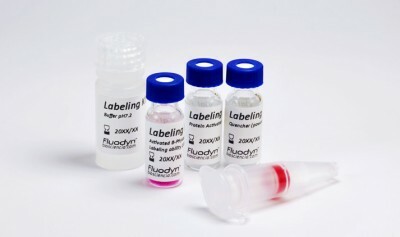 Compatible with a wide range of fluorescence using technics as Flow cytometry, Fluorescent microscopy and more, Fluodyn™ labeling kits are an innovative solution that allows you to easily label antibodies with APC and PE in about 4 hours. Optimized for antibodies, Fluodyn™ kits keep their performances with all proteins. Skip the secondary antibody, reduce cross-reactivity and background to improve accuracy of your detection. User friendly, our protein labeling kits are all in one, no buffer to prepare, clear proctocol, each reagent is calibrated and clearly identified to reduce errors. Fluodyn™ labeling kits offer you precision and quality of a primary antibody detection with simplicty, flexibility and cost efficiency of secondary labeling solution. Kits are perpetually available on our website and can be delivered quickly all around the world. Thanks to their adaptable labeling abilities, Fluodyn™ kits are fully scalable. Don’t find the dye or the labelling ability you need?